Attributes: Gluten Free, Natural or Organic Ingredients, Wheat FreeIngredients: Water, Concentrated Crushed Tomatoes, Onion, Flour (Rice Flour, Corn Flour, Tapioca Flour And Xanthan Gum), Whoel Milk Ricotta Cheese (Pasteurized Cheese Whey, Whole Milk, Vinegar, And Salt), Canola Oil, Sugar, Garlic, P.. Attributes: Gluten Free, Natural or Organic Ingredients, Wheat Free, Yeast FreeIngredients: Gluten Free Dough: Domata Living Flour (Rice Flour, Corn Starch, Tapioca Dextrin, Xanthan Gum), Eggs, Water, Salt, Canola Oil, Guar Gum, Sodium Alginate. Filling: Whole Milk Ricotta Cheese (pasteurized whole.. Attributes: Gluten Free, Kosher, Natural or Organic Ingredients, Wheat Free, Yeast FreeIngredients: Gluten Free Dough: Domata Living Flour (Rice Flour, Corn Starch, Tapioca Dextrin, Xanthan Gum), Eggs, Water, Salt, Canola Oil, Guar Gum, Sodium Alginate. Filling: Whole Milk Ricotta Cheese (Pasteuri.. 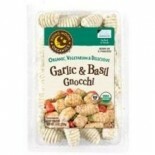 Attributes: Natural or Organic Ingredients, VeganIngredients: Water, Organic Potato, Organic Unbleached Flour, Sea Salt, Organic Garlic, Organic Basil, Organic Parsley. Contains Wheat. Nutritions: Calcium(2), Calories(220), Cholesterol(0), Dietaryfiber(3), Fromfat(0), Iron(10), Protein(6), Saturat.. Attributes: Contains Refined Sugars, Dairy Free, Lactose Free, Natural or Organic Ingredients, Vegan, Yeast FreeIngredients: Pasta: Organic Unbleached Flour, Water, Organic Semolina Flour, Organic Turmeric. 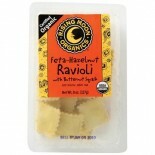 Filling: Organic Soy Ricotta (Organic Soy Bean Fiber, Purified Water, Corn Starch, Organic Ri.. 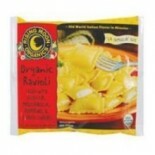 Attributes: Natural or Organic IngredientsIngredients: Pasta Ingredients: Organic unbleached wheat flour, water, organic semolina flour, organic whole eggs, organic parsley, organic turmeric. Filling Ingredients: Organic half & half (organic milk, organic cream), water, organic basil, organic moz.. Attributes: Natural or Organic IngredientsIngredients: Pasta: Organic Unbleached Four, Water, Organic Semolina Flour, Organic Eggs, Organic Parsley, Organic Turmeric. Filling: Organic Milk, Organic Cream, Water, Organic Basil, Organic Mozzarella Cheese (Organic Milk, Cheese Cultures, Enzymes, Salt),.. 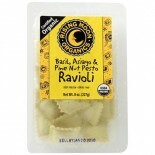 Attributes: Natural or Organic IngredientsIngredients: Pasta Ingredients: Organic unbleached wheat flour, water, organic semolina flour, organic turmeric. Filling Ingredients: Organic butternut squash, organic dried cane syrup, organic potato flakes, sea salt, organic onion, organic garlic, orga.. Attributes: Contains Refined Sugars, Dairy Free, Lactose Free, Low Fat, Natural or Organic Ingredients, Vegan, Yeast FreeIngredients: Organic Unbleached Flour, Water, Organic Semolina Flour, Organic Turmeric. 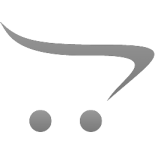 Filling: Organic Butternut Squash, Organic Evaporated Cane Juice, Organic Potato Flour, Sea.. 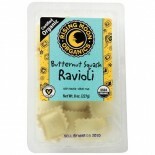 Attributes: Natural or Organic IngredientsIngredients: Pasta: Organic Unbleached Flour, Water, Organic Semolina Flour, Organic Eggs, Organic Turmeric. Filling: Organic Butternut Squash, Organic Potato Flour, Organic Feta Cheese (Organic Milk, Cheese Cultures, Enzymes, Salt), Water, Organic Roasted H.. 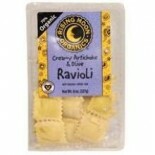 Attributes: Natural or Organic IngredientsIngredients: These delicious raviolis paired with tangy cheeses will have you mooning! 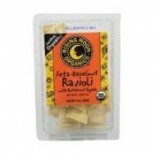 Pasta Ingredients: Organic unbleached wheat flour, water, organic semolina flour, organic whole eggs. 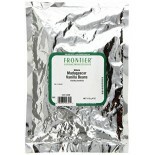 Filling Ingredients: Organic ricotta cheese (organic whole milk, .. 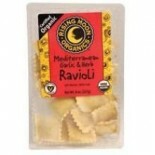 Attributes: Natural or Organic IngredientsIngredients: Pasta: Organic Unbleached Flour, Water, Organic Semolina Flour, Organic Eggs, Organic Beet, Organic Annatto, Organic Merlot Wine. 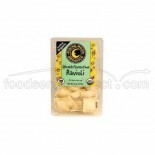 Filling: Organic Milk, Organic Cream, Water, Organic Mozzarella Cheese (Organic Milk, Cheese Cultures, Enzymes, Sal.. 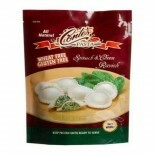 Attributes: Natural or Organic IngredientsIngredients: Pasta: Organic Unbleached Flour, Water, Organic Semolina Flour, Organic Eggs, Organic Parsley, Organic Spinach. Filling: Organic Milk, Organic Cream, Water, Organic Potato Flour, Organic Mozzarella Cheese (Organic Milk, Cheese Cultures, Enzymes,.. Attributes: Natural or Organic IngredientsIngredients: Pasta: Organic Unbleached Flour, Water, Organic Semolina Flour, Organic Eggs, Organic Annatto, Organic Beet. Filling: Organic Milk, Organic Cream, Water, Organic Potato Flour, Organic Mozzarella Cheese (Organic Milk, Cheese Cultures, Enzymes, Sa.. Attributes: Contains Refined Sugars, Natural or Organic Ingredients, Yeast FreeIngredients: Pasta: Organic Unbleached Flour, Water, Organic Semolina Flour, Organic Eggs, Organic Turmeric. Filling: Organic Milk, Organic Cream, Organic Spinach, Water, Organic Feta Cheese (Organic Milk, Culture Culture.. 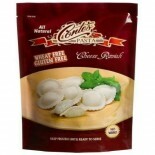 Attributes: Natural or Organic IngredientsIngredients: Pasta Ingredients: Organic unbleached wheat flour, water, organic semolina flour, organic spinach, organic spinach powder. Filling Ingredients: Organic soy ricotta (organic soybean fiber, water, organic vinegar, organic starch, sea salt, orga.. Attributes: Dairy Free, Natural or Organic Ingredients, Vegan, Yeast FreeIngredients: Pasta: Organic Unbleached Flour, Water, Organic Semolina Flour, Organic Turmeric. Filling: Organic Soy Ricotta (Organic Soy Bean Fiber, Purified Water, Corn Starch, Organic Rice Vinegar, Xanthan Gum, Organic Evapor.. Attributes: Dairy Free, Natural or Organic Ingredients, Vegan, Wheat FreeIngredients: Pasta: Organic Unbleached Four, Water, Organic Semolina Flour, Organic Turmeric. Filling: Organic Soy Ricotta (Organic Soy Bean Fiber, Purified Water, Corn Starch, Organic Rice Vinegar, Xanthan Gum, Organic Evapora.. Attributes: Natural or Organic IngredientsIngredients: Pasta: Organic Unbleached Flour, Water, Organic Semolina Flour, Organic Eggs, Organic Turmeric Organic Black Pepper. 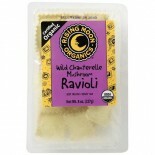 Filling: Water, Organic Milk, Organic Cream, Organic Crimini Mushroom, Organic Potato Flour, Organic Asiago Cheese (Organic Mi.. Attributes: Contains Refined Sugars, Natural or Organic Ingredients, Yeast FreeIngredients: Pasta: Organic Unbleached Flour, Water, Organic Semolina Flour, Organic Eggs, Organic Parsley, Organic Turmeric. 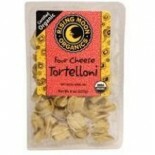 Filling: Organic Milk, Organic Cream, Organic Potato Flour, Organic Mozzarella Cheese (Organic .. Attributes: Contains Refined Sugars, Natural or Organic Ingredients, Yeast FreeIngredients: Pasta: Organic Unbleached Flour, Organic Semolina Flour, Water, Organic Eggs, Organic Turmeric. Filling: Organic Milk, Organic Cream, Organic Potato Flour, Organic Crimini Mushroom, Organic Starch, Organic Po.. 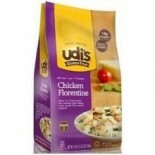 Attributes: Gluten Free, Natural or Organic IngredientsIngredients: Gluten Free Fusilli Pasta (Brown Rice Flour, Water, Potato Starch, Tapioca Starch, Eggs, Salt, Xanthan Gum), Grilled Seasoned White Meat Chicken (Chicken White Meat, Water, Potato Starch, Sea Salt), Water, Cream, Spinach, Fire-Roast..